If you want to record everything that is visible on your computer screen, use the Full Screen option. Use it to make tutorials, product demonstrations, presentations, and more. Click File >> Record >> Recording Options >> Full Screen. Multimedia presentations typically involve two factors: sight and hearing. When the video and audio are synchronized in a presentation, the content is better understood. Add audio narration to your screen recordings to make presentations and tutorials more interesting. Use a microphone to add your own audio narration to demonstrate any application or website. You must setup a Microphone to record your narration with the video. Use Record Microphone Audio option and select the respective Microphone from the Audio Recording devices dropdown list. Make sure that the Microphone is enabled as your audio recording device. You can also include the sounds from the computer speakers. For example, if you want to capture your favorite music playing on the PC during your screen recording, you can select Record system audio(speakers). Recording the audio from the microphone along with the speakers, allows you to record internet chat or any multimedia applications and add your own narration to it. You can choose to record the screen activity without audio. Eliminating audio from your screen recordings results in smaller file sizes. You need to uncheck both Record Microphone audio and Record system audio (Speakers) option to record your video without audio. Note: If you have selected both Record Speakers and Record Microphone options then make sure both devices should have same sample rate and bit depth. 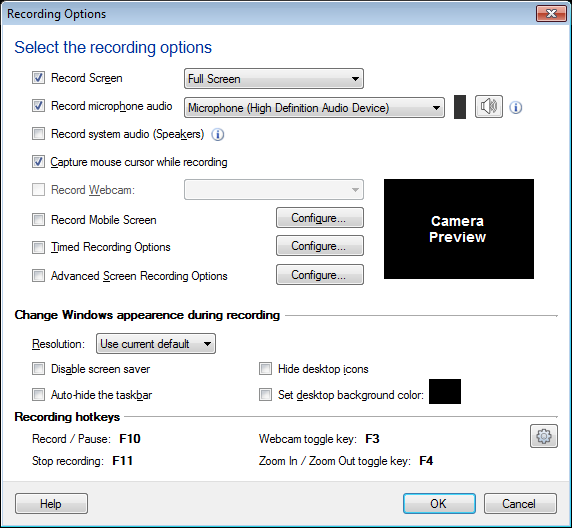 My Screen Recorder Pro allows you to capture Webcam image during Screen Recordings. Select Record Webcam checkbox and choose the required webcam from dropdown menu. You can directly use Hotkey associated with a webcam and a webcam window will appear on PC screen. Customize the size and position of the Webcam window and capture interactive videos by adding your face to the presentations. My Screen recorder pro allows you to capture your mobile screen during screen recording. 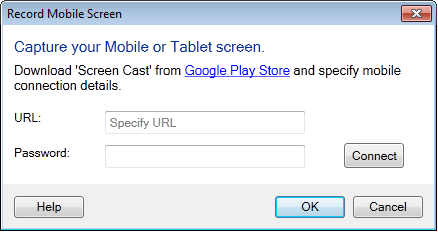 To use this feature, you will need to install Screen Cast application on your mobile device. Get it now from play.google.com/store. Select Record mobile screen checkbox and configure the settings by providing URL from Screen Cast application. Use hotkey to cast your mobile to your PC screen. You can customize size and position of mobile screen preview window on your PC. When you record the screen, the mouse cursor is captured by default. You can use the mouse cursor to highlight text or to point at the items while making a presentation, tutorial, or demonstration. If you do not want to capture the mouse cursor, disable it by deselecting the option Capture mouse cursor while recording. 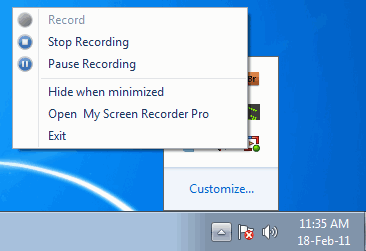 My Screen Recorder Pro allows you to record last few minutes of screen recordings or you can choose to record for x minutes. In some cases you may not need the entire recording. Your requirement is only a few minutes of the last part of the recording. 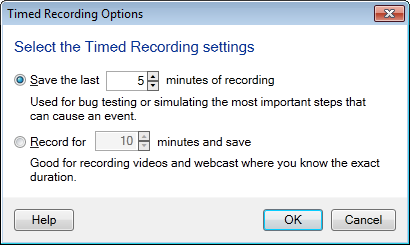 Save only the last few minutes of your recording, by specifying the number of minutes, in the Save the last "x" minutes of recordings option. If you want to limit your recording time duration then you can check Record for x minutes and save check box. Select a timing and the My Screen Recorder Pro will stop recording automatically after set time has reached. You can choose to perform screen recording when motion is detected or at predefined time intervals. Record when screen motion is detected: If motion detection recording is selected then My Screen Recorder Pro will watch your PC screen, selected application window or capture region for any change. For example, if a window is selected for recording then recording will start when any change or movement occurs in the window. If motion is not detected then recording will be automatically paused and the application goes into monitoring mode. 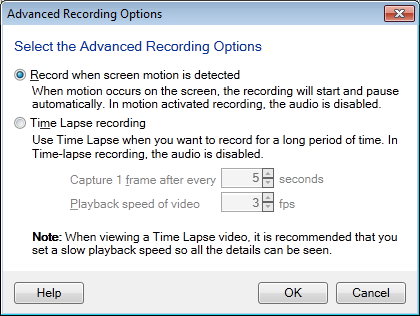 Note - Audio capture is disabled during motion detection recording. Motion detection recordings will be always created with 5 fps, regardless of any selected frame rate. You can also run the application in background and use motion detection recording and Time-lapse recording. Setting up Time-Lapse Recording: Continuous recording captures a lot of unnecessary footage. With time-lapse feature enabled, you can capture frames at predefined time intervals. When you playback your recording, time appears to be moving faster and thus lapsing. For example, one frame may be captured every second, and played back at 30 frames per second. The result would be an apparent increase of speed by 30 times. Start/Pause: The easiest way to start a screen recording is to press the F10 function key. The F10 key also acts as a toggle to pause and resume the screen recording. Use the F11 function key to stop the recording when you are finished. At the end of the recording, you will prompted to save the file. Save your file, then preview the recording using the built-in media player. Another way to Start the recording is to right click the application icon in the system tray, and click Record. You can change the keyboard shortcuts from the Tools menu >> Settings >> Hotkeys tab.